So while in Baltimore, or Bmore, as my husband calls it, I got to visit K Staton boutique, which is in the swanky district of Hampden. 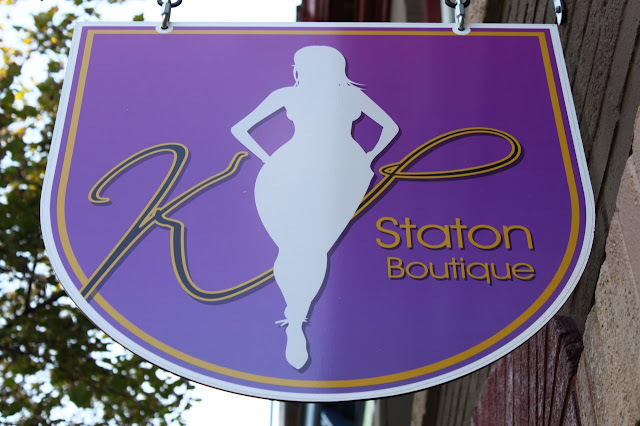 K Staton caters to women sizes 12+ and really provides that first class shopping experience that is really hard to come by in plus sizes. In the boutique, I saw designs from SWAK, MonifC, JIBRI, Not Your Daughter Jeans, Ladan's Closet, Spanx & much more. She also had very cute accessories. Needless to say it was not hard to spend do some shopping while I was there. Jade, the owner, is an absolute doll. I actually met her for the first time at Full Figured Fashion week a couple years ago and was I just thought her personal style & look is gorgeous. She did not disappoint this time around either. She is just as pretty and stylish as she can be. I wanted to put her in my pocket she was so cute. And if there is nothing more that I hate is when someone owns a boutique and does not bring their "A game" in their own personal appearance. Like how are you going to help me shop if you look a mess. Anyways, if you are in the area or just visiting it is definitely worth it to drop in. You can find her store at 1007A West 36th St, Baltimore, MD 21211. Check out her website for hours at www.kstaton.com. Oh by the way, I purchased my very first dress from Modcloth. I have gotten quite a few questions about the sizing and until now I had now idea how the items fit. I think the first thing to realize is that Modcloth uses different vendors for clothing, so the the fit may be a little different from brand to brand. I ordered this dress in a 4x, because the measurements seemed to be on the more like a continuation of regular sizes, which will always run small. Could I have went down a size? Yes, but by ordering the 4x I got a great length on the dress. On a dress like this if it were in regular plus sizes I would have ordered a 2x or a 1x if I squeezed...LOL. As a girl who loves the nautical trend this dress really allowed me to look as if "I'm cruising the high seas" in the winter. great post and i LOVE your dress!! i am from bmore (lol) and have never heard of this store. i am def going to go ASAP! thanks! That store looked like one of my shopping spree dreams fantasy. lol. I wish there was boutique in my town like that. I would love to check out those clothes in person. That dress looks very fab on you love the length to. I def need to check out modcloth. I love that dress! I am contemplating buying one for myself. I always wanted to ask you if you ever thrift. Do you? I will draw on my giveaway when I hit 75 followers. Please spread the word! @Jayla, I thrift from time to time. You look so cute in that dress!!! I've been wanting to order from there, but I haven't had a chance. Now you've encouraged me! love this dress on you..
Attentions: Here at Harlemvetz Entertainment & Management LLC. We are currently seeking Women who are interested in being apart of a upcoming Reality TV SHOW, Based in Atlanta Ga. We are shooting a new Show called All Curves of Atlanta. To be considered must be able to provide 3photos with a Brief BIO of your Self. The following video is a link of the old show and to give you a idea what to expect,Visit Video Link of the Show which was called BBWS of atlanta but recently changed the name to ALL Curves of Atlanta ! needing help figuring out my shape after these twins....I have a belly now and booty. not sure my size since shopping has been put on hold ...twins r 2 yrs.